U.S.P. Alcatraz, popularly known as “The Rock,” officially opened its doors to inmates on August 11, 1934. On that first ferry to the prison were notorious criminals Al Capone, Robert “Birdman of Alcatraz” Stroud and George “Machine Gun” Kelly, among others. During its surprisingly short time of operation, just shy of 29 years between 1934 and 1963, Alcatraz earned a dark history as a penitentiary. 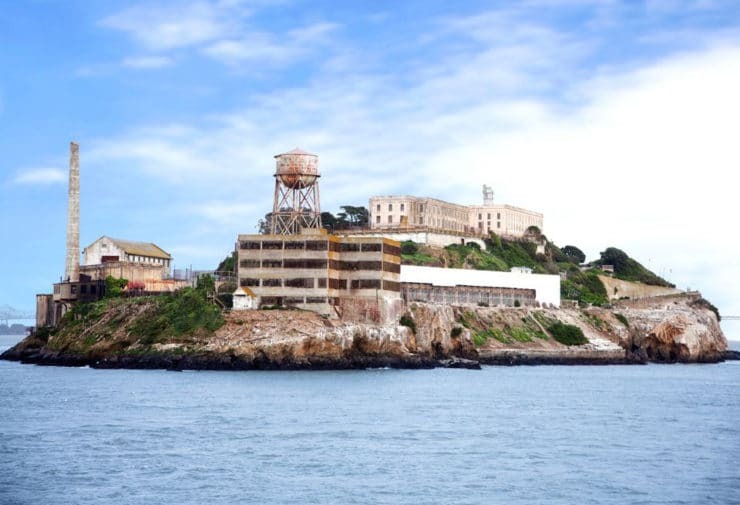 On a rugged, chilly island off the Northern California coastline, this prison was reserved for some of the most notorious criminals of the time—gangsters, murderers, bank and train robbers among them. Being isolated on this lonely island, with San Francisco city almost close enough to touch, was enough to drive some prisoners mad. During its years of operation there were 14 escape attempts. Only 2 of those attempts were successful, though many believe the prisoners who vanished were likely swept out to sea and drowned in the cold, turbulent, shark-infested waters (there is some debate about the participants of a 1962 escape attempt who may have survived). While many know about the harsh conditions on Alcatraz, few have heard about a bright spot in this otherwise bleak place—the food. Believe it or not, the food served at Alcatraz was widely considered some of the best in the U.S. prison system. I took a tour of Alcatraz last summer with my husband and was able to learn first hand about the superior culinary conditions in this otherwise dire place. 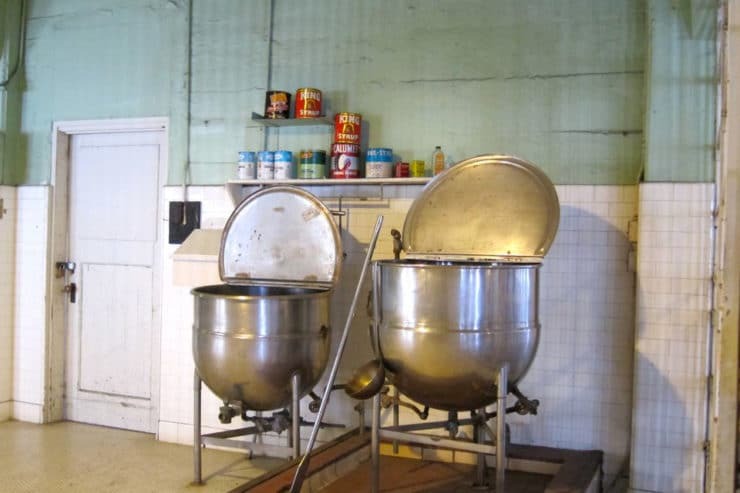 I also learned about the small non-prisoner community living on Alcatraz, made up of prison guards, their wives and children… many of whom loved to cook. Alcatraz earned its name from the Spanish explorer Juan Manuel de Ayala in 1775. He was the first recorded explorer to sail into the waters now known as the San Francisco Bay. He dubbed the island Isla de los Alcatraces (Isle of the Pelicans); the name was later Anglicized to Alcatraz. 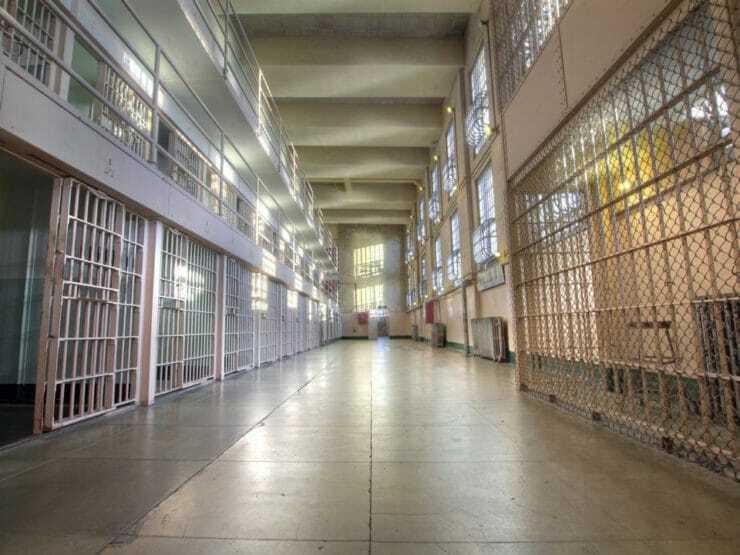 Excessively violent criminals were sent to Alcatraz for behavior modification, a new strategy by the U.S. Prison System that attempted to reform prisoners rather than just incarcerating them. Though this focus on rehabilitation was positive, Alcatraz was on the whole a fairly miserable place. The cells were small, ocean drafts were cold, and the inmates were some of the roughest around. The only plus side of being incarcerated at Alcatraz was the food. The ‘June Peas’ was an excellent choice and this trick of menu-making should be exploited as much as possible when certain foods are in season. Other words that come to mind are ‘baby, young, milk-fed, spring, new, fresh, native, various colors (such as mashed YELLOW turnips,” cold (such as CHILLED tomato juice), old fashioned, home-made etc. The title of a dish can do much in creating anticipation. Given that Alcatraz was located on an island, bulk orders of food had to be carried over by boat and stored in the basement. The standard kitchen included additional space for a vegetable room, butcher shop, bakery and even an ice cream freezer. Fresh fruit and vegetables came from San Francisco’s produce district. Surplus canned or dehydrated items came from the military in an effort to decrease spending. All fresh water used for food, drink, laundry, showers and everything in between was brought in on boats and stored in a large tank on the island. Meals were served-cafeteria style and inmates could take as much as they wished, as long as they cleaned their plates. If they did not clean their plates, they would forfeit a future meal. The dining hall rules stated: “Take all that you wish—eat all that you take.” Menu items, authorized by the Public Health Service, were rotated to ensure that nutritional standards were met. A typical meal consisted of soup, a salad or vegetable, a starch in the form of bread, pasta, rice or potatoes, meat and dessert. 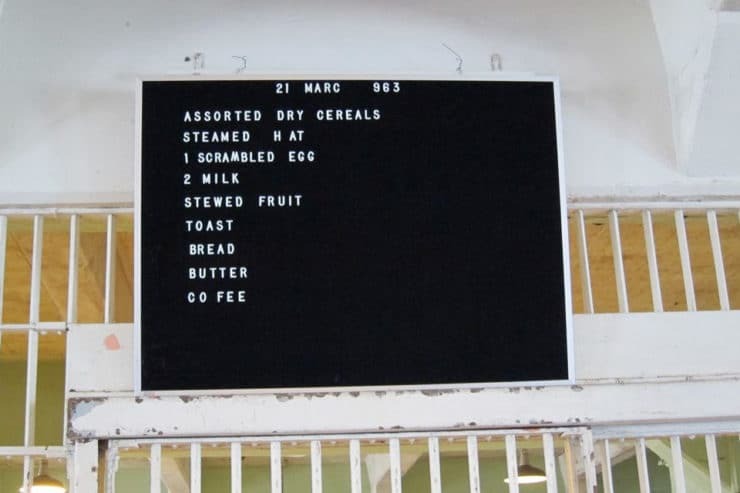 In 1939, when the administration purchased a letter board to display the daily menu, it was placed above the steam table between chalkboards listing the scores of professional baseball and football games, as well as those of Alcatraz’s own baseball teams. On holidays, meals might include turkey or steak, and the inmates received additional gifts of candy, cigarettes and fruit. Breakfast pastries like fruit snails and cinnamon snails, now known as fruit Danishes and cinnamon buns, were sometimes served and a welcome treat for inmates. 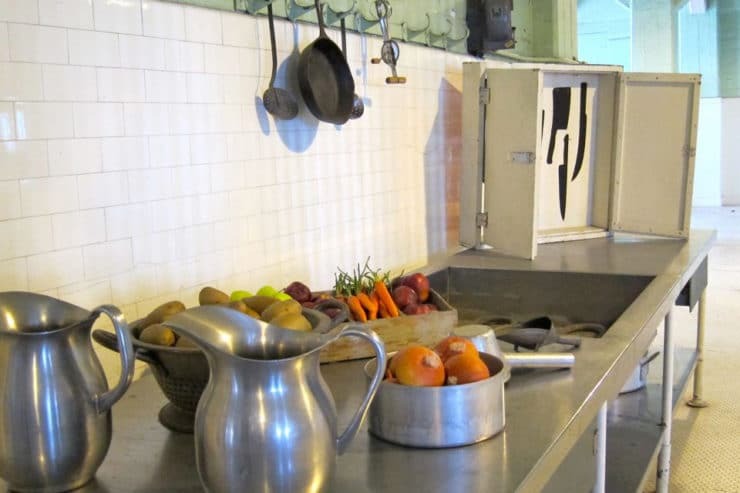 Prisoners who worked in the kitchen were not given extra food or special privileges, though they appreciated the opportunity to create friendships with the kitchen staff. 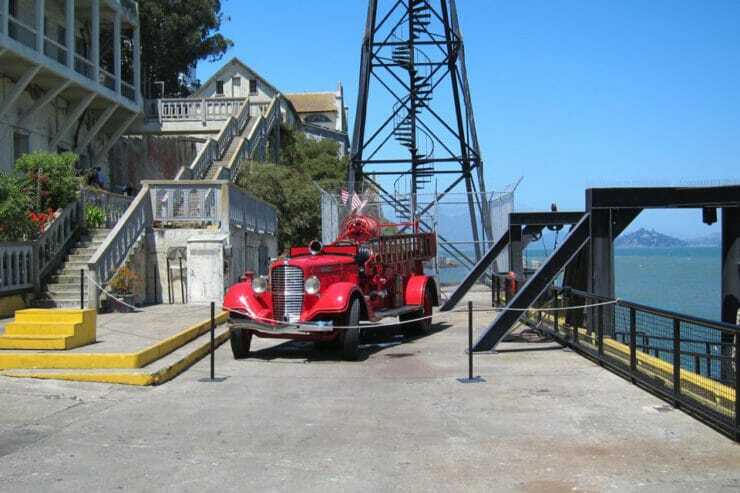 Though the island of Alcatraz was mainly used for the incarceration of inmates, it was also home to a small community made up of the prison guards and their families. The civilian population totaled about 260 people, 60-90 of them children, living on five acres of land. Life on the island was difficult, as routine activities like grocery shopping had to be done in San Francisco via ferry. In an effort to create a sense of unity, the women on Alcatraz began organizing social clubs. During the 1950s, community cookbooks were put together and sold to raise funds for holiday parties, children’s activities and Sunday School events. On my visit to Alcatraz I purchased a reprint of one such community cookbook—the Alcatraz Women’s Club Cook Book. Originally published in 1952, the book is full of retro-style recipes including Hamburger Pie, Tuna Fish Casserole and Chicken Spaghetti. There are also several baked goods and sweet recipes, including the following recipe for Cinnamon Sugar Cookies, contributed by Mrs. Estelle Fisher. These cookies are made with shortening, which was quite popular during the 50’s as an alternative to butter. Shortening also would have been more shelf-stable and easier to store than fresh butter, which was more difficult to get hold of on Alcatraz. 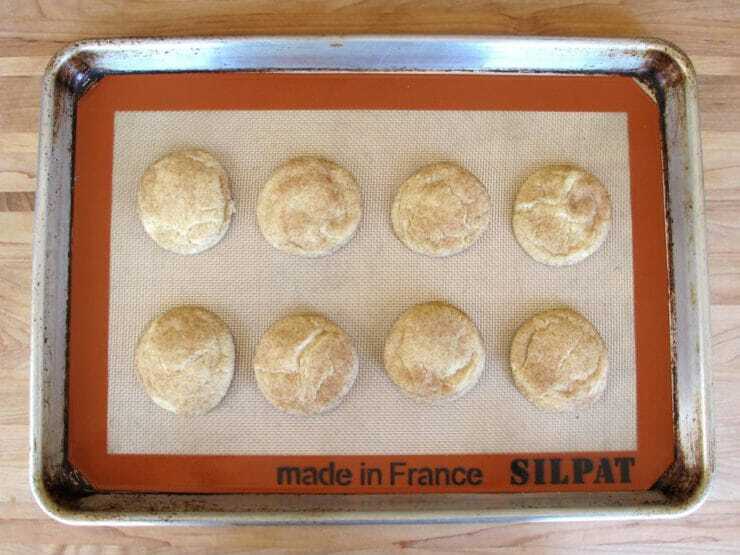 The recipe produces a sweet, simple, delightful cookie similar to a snickerdoodle. They are perfect for dunking into tea or coffee. They can easily be overbaked, so watch carefully—take them out when they are just done, as even a minute more of baking can cause them to turn crisp. They’re not bad when they’re crisp, but I much prefer them on the softer side. I’m thinking they would be even better if I subbed butter for shortening, but I haven’t had a chance to try it yet. If I do I’ll come back and update the blog. Due to structural deterioration and the rising cost of maintenance, Alcatraz was closed in 1963. These cookies are a tasty reminder of the oft forgotten families living on Alcatraz. If you’re interested and want to learn more, I suggest reading Al Capone Does My Shirts, a terrific young adult novel by Gennifer Choldenko. Though the story is fictional, Choldenko did a lot of careful research into the lives of the civilian Alcatraz community. It’s a fun and informative read. Snuggle up in a cozy chair, grab a plate of Cinnamon Sugar Cookies and a glass of milk, and get lost in the history! 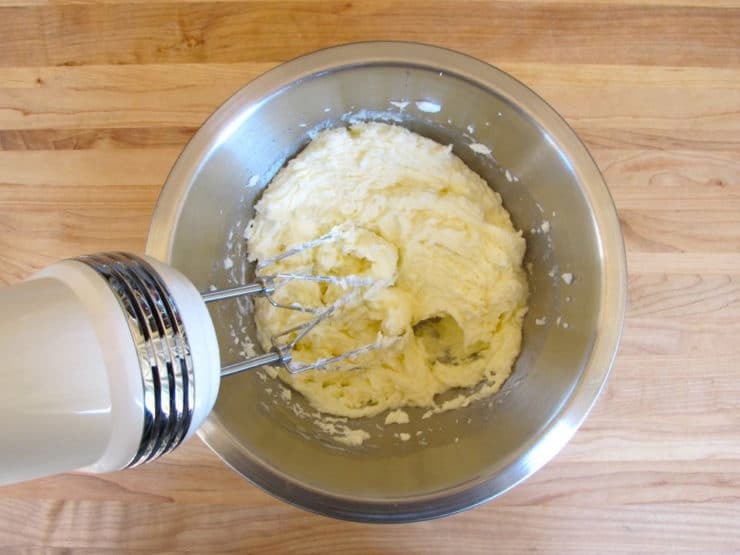 In a mixing bowl, cream together the shortening, 1 1/2 cups sugar, and eggs. 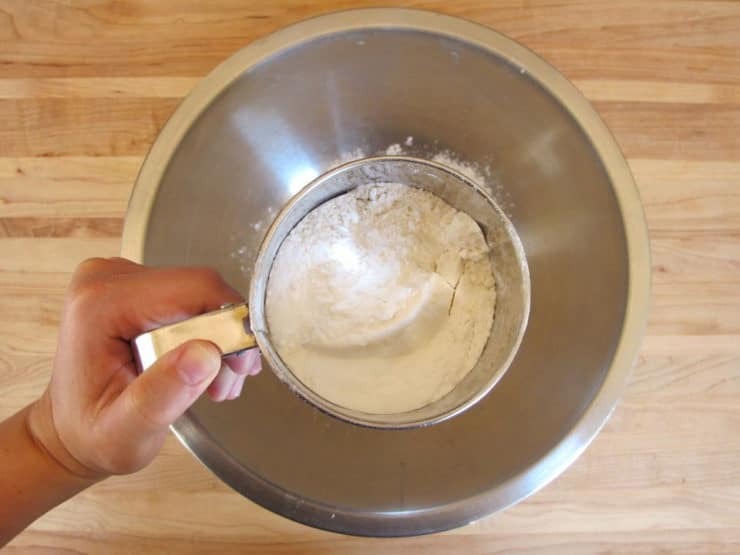 In a separate bowl, sift together the flour, cream of tarter, baking soda and salt. 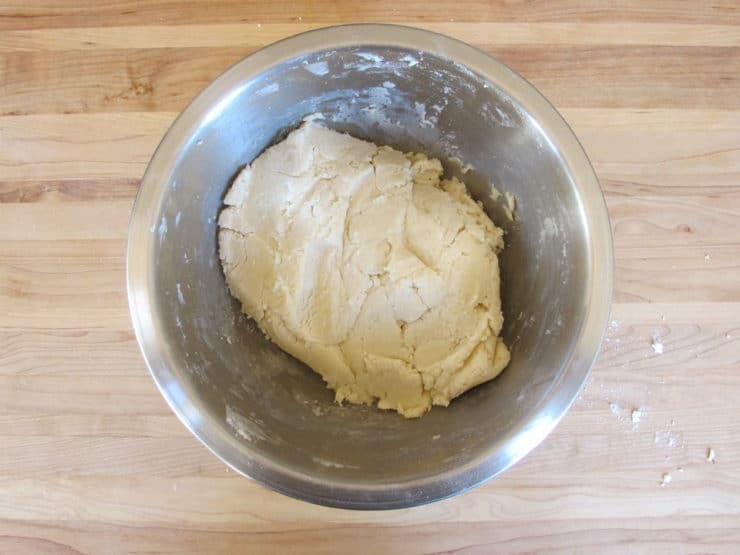 Combine the wet and dry ingredients and mix with a wooden spoon or spatula to form a soft dough. 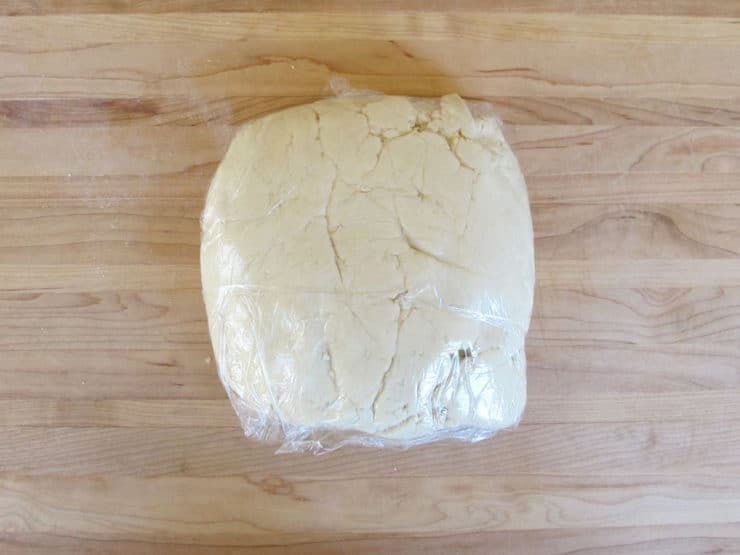 Gather the dough into a pile, wrap in plastic wrap, and refrigerator 6 hours to overnight, or until thoroughly chilled. Preheat oven to 400 degrees F. In a small bowl, mix together remaining 2 tbsp sugar and 2 tsp cinnamon. Roll dough into balls the size of small walnuts. 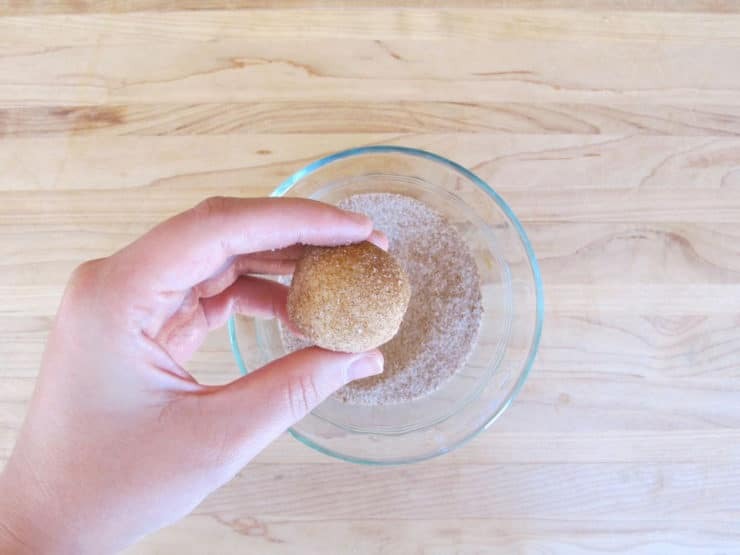 Roll the balls into the cinnamon and sugar mixture to coat. 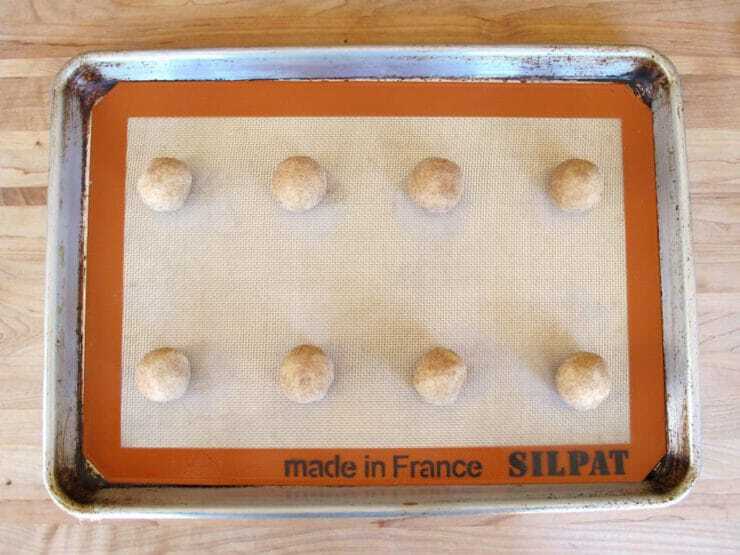 Place the balls a full 2 inches apart on an ungreased baking sheet (they will spread quite a bit!). Bake until lightly browned but still soft, around 8-10 minutes. The cookies will puff up at first, then flatten out. Let cool on a wire rack, then serve. Alcatraz Women’s Club Cook Book (1952, republished 1995). Collected Recipes. Golden Gate National Parks Conservancy, US. The Bureau of Prisons (2008). Alcatraz: Rules, Regulations and Brief History. Ocean View Publishing, US. “The First Prisoners Arrived at Alcatraz Federal Penitentiary.” America’s Story from America’s Library. Library of Congress, n.d. Web. 09 Aug. 2013. U.S.P. Alcatraz Dining In Food Magazine. Golden Gate National Parks Conservancy, US. What a thoughtfully written article! This is fascinating history and you have honored the families and services rendered at Alcatraz in its finest light. These cookies will have a unique meaning as their sweet smell wafts from the oven. Thank you so very much! 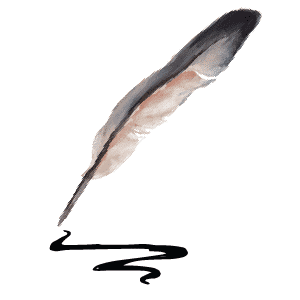 Kira I’m so pleased you enjoyed the article, thank you for writing! Looks like a snicker doodle recipe. One of my co-workers brought in a homemade batch for our July 4 pitch-in — tasted just like my grandmother’s! “Scared Straight ” ! Jerry the Jew. Aren’t they the same as Snickerdoodles? Ann yes 🙂 The community cookbook from Alcatraz calls them Cinnamon Sugar Cookies but they’re the same as snickerdoodles. They’re great made with butter, too… recipe listed shortening because fresh butter was harder to get when you had to ferry in to the mainland for ingredients. I had a friend who was in Alcatraz, he said it was miserable and the food didn’t come close to easing any bad opinions he had of the place. He was transferred to Leavenworth when it closed. Veryl now that is cool, was he imprisoned or a guard? He was prisoner, during that time he lost contact with his wife and daughter, when he got out, he vowed to help save others from that fate, he bought a van and transported wives and families to our state prison across state. He was a great guy. He was given a medal by President Reagan. That was a great trip! Lol I was there last week! Amazing story. Do you think the shortening can be replaced (w/ butter, of course)? Hi Eugenia, it should work fine as I said in the blog post above, perhaps even better than the shortening. Enjoy! These cookies look like what cookies my mother would make. She called them “Snickerdoodles”. They´re yummy! Wonderful article! Do you know of any cookbooks with recipes used in the prison itself? Does the Alcatraz Dining In Food Magazine have some? I don’t unfortunately Karen, and there are none in the magazine… but there are several menus in the magazine with detailed lists of what was served for breakfast, dinner and supper, organized by date. So glad you enjoyed them Petra! That is an interesting article since I am from S.F. origionaly. 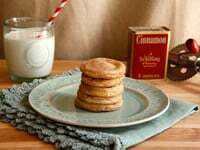 The recipe is what I have known as Snickerdoodles..
What an amazing story – I´ve live in San Francisco my entire life, and had no idea about the philosophy of the prison meals. Thanks! Glad it was a fun read for you Ali. I had a lot of fun working on the piece. It’s kind of a haunting place to visit. Nice history of the island. I have also visited there and was stunned to learn of the civilians who lived there. Thank you for the memory jog. Great story and the cookies sound good…and a lot like Snickerdoodles! Thanks for the story! Do we have to go to jail–or bust out–to get some? Tori, once again you hit one out of the park ! What an interesting article, made even better with your personal observations. Thanks for yet another fascinating story. I visited Alcatraz while I was in college. I have always been fascinated by it. Interesting read! In the 1970’s a group of Native Americans reclaimed and occupied (then abandoned) Alcatraz. For a day, I was there with them. They set up the kitchen cooking traditional native american foods. It was the first time I was treated to a taste of fried bread. The Alcatraz occupation was a fascinating moment in history. (And food history!) It started in November 1969, as a Thanksgiving feast promoting solidarity among American Indians. (San Francisco’s Bratskellar Restaurant donated a lot of the food.) The occupation lasted a year and a half and garnered a lot of national media attention. There have been several books about the occupation, including Adam Fortunate Eagle and Tim Findley’s Heart of the Rock: The Indian Invasion of Alcatraz (2002). Just wanted to add that I really enjoyed this article, Tori! I just made snickerdoodles the other day. One of my FAVS!! Thanks for the great story. I love snicker doodles…especially at Christmas time! Thank You for sharing this very interesting story. Many facts that I didn´t know. Now I will share this. 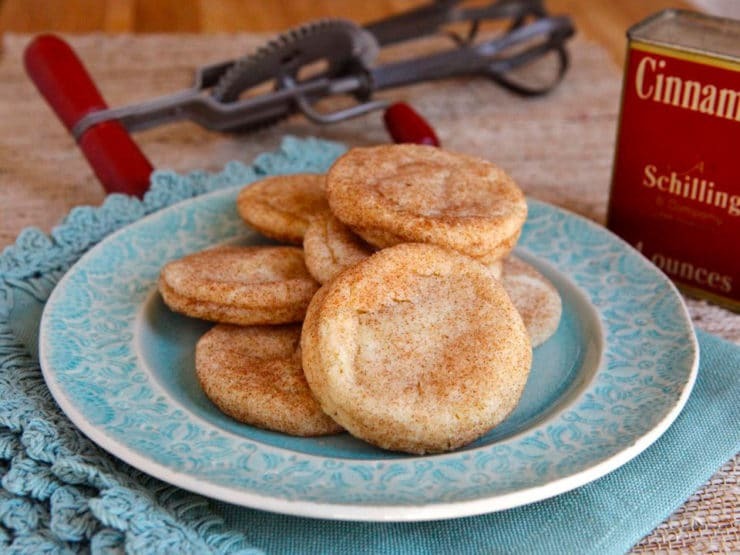 These are so close to snickerdoodles, I’m sure that’s the origin of the recipe. Using butter instead of shortening would probably make them taste identical. I always enjoy your posts. Next time I’m in San Francisco, I’ll definitely take the tour of Alcatraz! Great story, they do look like Snickerdoodles! So glad Heather! It is really a fun book. I’m a sucker for good YA/teen fiction, especially when it has a historical setting. Very interesting article. Food history comes from many different venues. I´d only read “The Birdman of Alcatraz,” so that was my only knowledge of this prison. Thank you so for this viewpoint. Things seem to seriously have changed in terms of prison food since then. This is very interesting, thank you for sharing! What an interesting article!! Thank you for sharing that!